One of the most influential voices calling for American independence was that of an Fnglisb – man. He was a Republican named Thomas Paine, who immigrated to America in 1774. Later in 1776, as Washington’s discouraged army retreated from the advancing British, Paine rallied the Americans with a new pamphlet called The Crisis. Its words are stili remembered in times of difficulty by Americans today. “These are the times that try men’s souls,” Paine wrote. “The summer soldier and the sunshine patriot will, in this crisis, shrink from the service of his country; but he that stands now deserves the love and thanks of man and woman.” In one of the darkest hours of the war Paine’s words helped to save Washington’s armies from melting away and inspired new supporters to join the American cause. life in America to produce a new definition of democratic government. This new’ definition said that governments should consist of representatives elected by the people. It also said that the main reason that governments existed was to protect the rights of individual citizens. authority. Washington set to work to train his men and turn them into disciplined soldiers. But this took time, and meanwhile the Americans suffered defeat after defeat. In September 1776, only two months after the Declaration of Independence, the British captured New York City. Washington wrote to his brother that he feared that the Americans were very close to losing the war. Success began to come to the Americans in October 1777. They trapped a British army of almost 6,000 men at Saratoga in northern New York, l’he British commander was cut off from his supplies and his men were facing starvation. He was forced to surrender. The Americans marched their prisoners to Boston. Here, after swearing never again to fight against the Americans, the prisoners were put on board ships and sent back to England. Benjamin Franklin, the American ambassador to France, was delighted when he received the news of the victory at Saratoga. Flc used it to persuade the French government to join in the struggle against Britain. In February 1778, the French king, Louis XVI, signed an alliance with the Americans. French ships, soldiers and money were soon playing an important part in the war. From 1778 onwards most of the fighting took place in the southern colonics. It was here that the war came to an end. In September 1781, George Washington, leading a combined American and French army, surrounded 8,000 British troops under General Cornwallis at Yorktown, on the coast of Virginia. Cofnwallis was worried, but he expected British ships to arrive and rescue or reinforce his army. When ships arrived off Yorktown, however, they were French ones. Cornwallis was trapped. 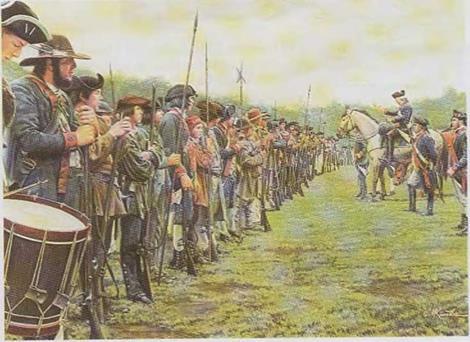 On October 17, 1781, he surrendered his army to Washington. When the news reached London the British Prime Minister, Lord North, threw up his hands in despair. “It is all over!” he cried. North was right. The British started to withdraw their forces from America and British and American representatives began to discuss peace terms. In the Treaty of Paris, which was signed in September 1783, Britain officially recognized her former colonies as an independent nation. The treaty granted the new United States all of North America from Canada in the north to Florida in the south, and from the Atlantic coast to the Mississippi River. The unveiling of the Statue of Liberty. On a small island in New York harbor stands a giant statue of a robed woman. She looks out to sea, her right arm holding a torch high in the air. She is the Statue of Liberty, one of the best-known landmarks in the world. 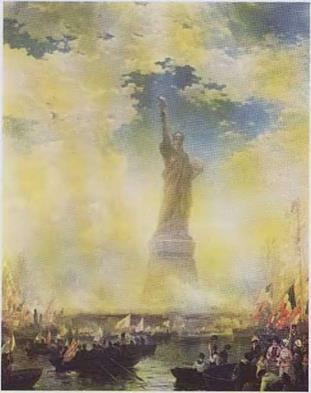 The Statue of Liberty was presented to the United States in 1886. It was given by the people of France to mark the hundredth anniversary of the War of Independence. The story of the American people is a story of immigrants. More than 75 percent of all the people in history who have ever left their homelands to live in another country have moved to the United States. In the course of its history it has taken in more people trom other lands than any other country in the world. Since the founding ofjamestown in 1607 more than fifty million people from other lands have made new homes there. Between 1840 and 1860 more immigrants than ever before arrived. Most came from Europe. Poor crops, hunger and political unrest caused an estimated five million Europeans a year to leave the lands of their birth at this time. More of them went to the United States than to any other country. Among these immigrants were many Irish people The Irish depended for food upon their crops of potatoes. For five years after 1845 these became diseased and rotted in the fields. About 750,000 Irish people starved to death. Many of the survivors left Ireland and went to the United States. In 1847 alone more than 118,000 of them immigrated there. By 1860 one in every four of the people living in the city ol New York had been bom in Ireland. Today more than thirteen million Americans have Irish ancestors. During the Civil War in the 1860s the federal government encouraged more emigration from Europe. It did this by offering land to immigrants who would serve as soldiers in the Union armies. By 1865 about one in five of the soldiers in the armies of the North was a wartime immigrant. Many had come from Germany. Today about one in three of all Americans have German ancestors. Ireland is in the west of Europe. Germany is in the north. Until about 1880 most immigrants to the United States came from these regions. Then a big change took place. More emigrants from lands in the south and cast of Europe began to arrive-Italians, Poles, Greeks, Russians, Hungarians, Czechs. By 1896 more than half of all the immigrants entering the United States were from eastern or southern Europe. . . the exploitation of labor was fearful and my father was having a terrible time. He was just getting by, making a living working twelve to fourteen hours a day. And he was suffering like a coal miner suffers, because in the sweat-shops [clothing factories], at that time, instead of coal dust what you got was lint. . . Lint got down the throat and into the lungs and caused the same coughing, the same diseases, the same sickness as dust. And in the end it killed you. And in the end it probably was what killed him. . . But he still wanted to live in America. He never became rich, he never became successful-and he never became bitter. . . Remember, he had come from a place where, if you were Jewish, you didn’t count as a human being and you had no rights at all. Between 1880 and 1925 about two million Jews entered the United States. Today there arc about 5.7 million Jewish Americans and they make up about 2.2 percent of the total population of the United States. In certain states along the Atlantic coast the percentage ofjews is higher. In the state of New York, for example, one person in ten is Jewish. So many immigrants wanted to enter the United States in the late 1800s that the government found it difficult to keep check on them. To control the situation it opened a special place of entry in New York harbor. This place was called Ellis Island. All intending immigrants were examined there before they were allowed to enter the United States. 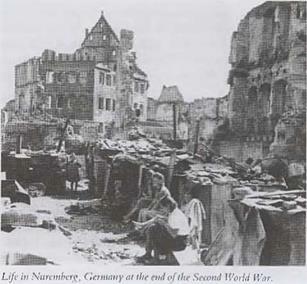 When the lighting in Europe ended in the spring of 1945, soldiers from the main Allied powers – the United States, the Soviet Union, Britain, and France-each occupied one of four zones into which Germany was divided. The idea was that this division would only be temporary. Once the Allies could agree on the details, they intended the whole country to be ruled again by one govern­ment. Each wanted to be sure, however, that this united Germany would be friendly towards them. Stalin felt especially strongly about this. The Soviet Union had suffered from the Germans more than anyone. The only friendly Germany Stalin could think of was a Germany controlled by communists. The United States, Britain, and France were determined to prevent this. The result was that little progress was made in the many dis­cussions that were held about Germany’s future. By 1946 it was already becoming clear that not one but two Germanies were beginning to take shape-a communist one in the Russian-controlled east of the country and a non-communist one in the west. Deep inside the Russian zone was the city of Berlin. Since Berlin was Germany’s old capital, it, too, had been divided between the Allies into areas called sectors. To link the western sectors of Berlin with the outside world the Russians had agreed to let goods and people pass freely through their zone of Germany. Europe’s recovery from the Second World War was painfully slow. By the summer of 1947 two years had passed since the last shots were fired. Yet millions of people were still without work, without decent homes, without sufficient food. Allied n’.r. 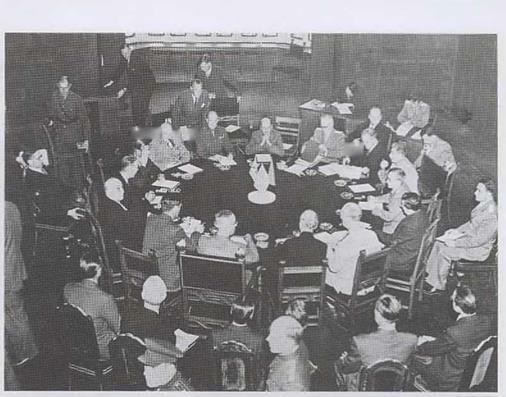 hi meet to divide up Europe at the Polsdcmt Conference, 1945. In France and Italy communist parties won lots of support by promising reforms to make things better. This worried President Truman. In the summer of 1947 his government put forward a scheme that he hoped would help Europe’s people and also make communism less appealing to them. The scheme was called the Marshall Plan, after General George Marshall, the Secretary of State who announced it. The United States had plenty of all the things that Europe needed in 1947 —food, fuel, raw materials, machines. The trouble was that Europe was too poor to buy them. To solve this problem Marshall offered to give European countries the goods they needed. Marshall offered help to the Soviet Union, too. But a Soviet newspaper described his scheme as “a plan for interference in the home affairs of other countries. ” Stalin refused to have anything to do with it. I Ic also made sure that none ot the countries on the Soviet Union’s side of the iron Curtain accepted help either. But millions of dollars’ worth of American food, raw materials and machinery started to pour into western Europe. It was like giving a dying person a blood transfusion. By the time the Marshall Plan ended in 1952, western Europe was back on its feet and beginning to prosper. By then containment was being tested in Asia also. The test wras taking place in Korea. Before the Second World War, Korea had been ruled by Japan. When Japan surrendered in 1945, the north of Korea was occupied by Soviet forces and the south by Americans. The boundary between the two areas was the earth’s 38th parallel of latitude. 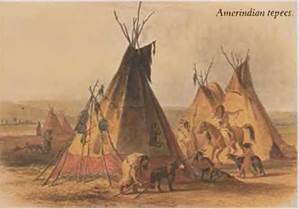 To many people the tepee is a symbol of the Amerindian way of life. This large cone-shaped tent was invented by the buffalo hunters of the western grasslands. It was built round a framework of about twelve slim, wooden poles approximately twenty feet long. The thin ends of the poles were tied together with strips of buffalo hide and the poles were raised and spread until their bottom ends formed a circle about fifteen feet in diameter. As many as forty buffalo hides were sewn together then spread over the frame, their ends fastened to the ground by pegs. A doorway covered with a flap of skin was left in the side and an opening at the top acted as a chimney. The outside of the tepee was decorated with painted designs that had religious or historical meanings. fast-flowing rivers to spawn. A few months’ work during this season provided the people of the Pacific coast with enough food to last a whole year. This abundance of food gave the tribes of the Pacific coast time for feasting, for carving and for building. Tribes like the Haida lived in large houses built of wooden planks with elaborately carved gables and doorposts. The most important carvings were on totem poles. These were specially decorated tree trunks which some tribes placed in front of their houses, but which the Haida made part of the house itself. The carvings on the totem pole were a record of the history of the family that lived in the house. The Amerindian peoples of North America developed widely varied ways of life. All suited the natural environments in which the tribes lived, and they lasted for many centuries. But the arrival of Europeans with their guns, their diseases and their hunger for land would eventually destroy them all. Most of the settlers who traveled to Oregon made the journey in four-wheeled wagons. A group of these wagons traveling together was called a “wagon train.” A wagon train usually consisted of about twenty-five wagons, each with a canvas cover to protect its contents from the weather. Seen from a distance, these covers made the wagons look like ships sailing across a sea of grass. Because of this, people often called wagons “prairie schooners.” A schooner was a type of sailing ship. Each wagon could carry a load of between 2 and 2Vz tons and was pulled by a team of either mules or oxen. Settlers argued fiercely about which animals were better. Some claimed that mules were faster and tougher than oxen. Others argued that oxen were stronger than mules and easier to control Some people believe that the phrase “as stubborn as a mule” became part of the English language at this time. Cost usually settled the arguments. A settler could buy three oxen for the price of only one mule. For this reason oxen were used more than any other animals to pull the wagons that traveled the Oregon Trail. 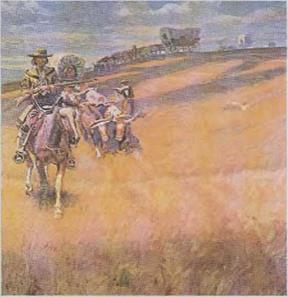 A wagon train eroding the prairie.